Tongariro muffins rise to the occasion!! 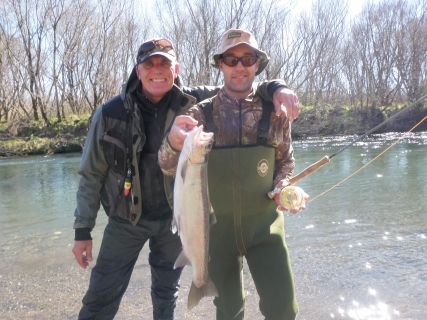 In all seriousness the river is in amazing condition and I don’t think I have seen it fishing so well with great condition fish and no slabby ones mixed in. The slabby fish will start appearing again in the next few weeks as they would have done their jobs and be on the way back to the lake for another year of living in the depths. It is times like these that I wish my phone would go crazy with guiding work as I know I could give people some amazing fishing. 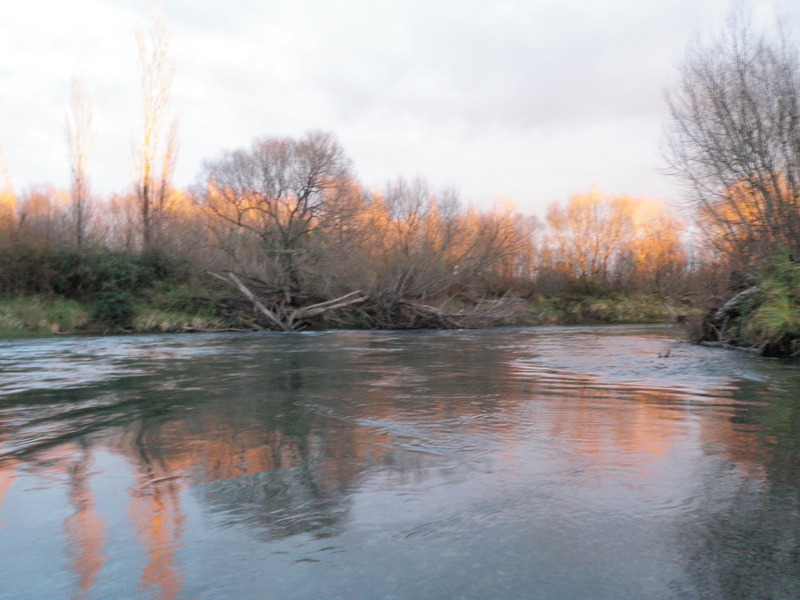 With rain forecast this week I will be expecting good numbers of fish to continue pushing into the river and running the lower river fairly quickly to reach suitable water to get down to business. Angling pressure on the Tongariro and Taupo rivers is high at the moment and you have to be prepared to fish with other anglers in most cases, especially gentleman’s hours. 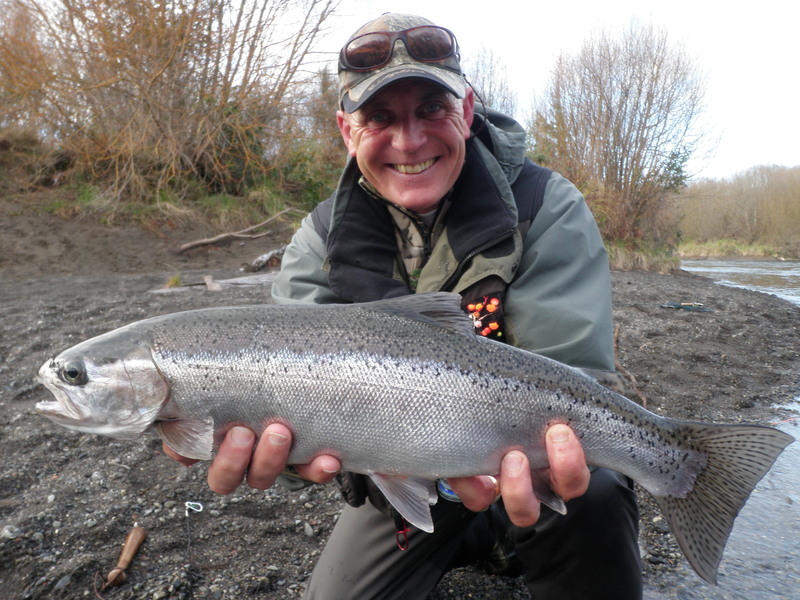 The lower river has been the busiest and I strongly recommend heading up river for good fishing and large pieces of water to yourself. I have really been trying to get my clients on the river at first light to ensure the first drift through areas which have fished really well, results speak for themselves. 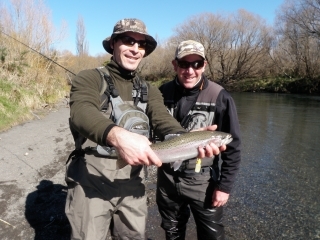 In saying that today I guided Sam and Jullianne from Aus which did not want to start till 10am in Taupo and they still managed 5 fish from the braided area using brightly coloured glo bugs in the faster riffles, go figure. Other Taupo riversÂ have not been as productive in the last week but I do believe the Waimarino would be the next best in line closely followed by the Hine when conditions suit. I have not heard any reports from the TT but judging by the amount of cars which are parked in the turning circle something must be creeping up there. Fish seem to be pushing to the upper river here very quickly and I think that it really pays to be inÂ the right spot at the right time when fishing here. The Waytahanuie has had some fish in it but no big runs have pushed over the ledge yet to offer anglers in the river constant rewards. A subject which always comes up on the river while fishing is what pound line to use as a leader and does it have to be flurocarbon? My opinion on this changes from summer to winter and with different conditions but the way thatÂ I have been fishing this winter seems to be cost effective and successful. I start my leader from my fly line at 12lb maxima nylon and atatch with a loop to loop connection making this piece say 4 foot. The next piece is 8lb flurocarbon which is about 6 feet and runs all the way to my first fly and from there I muck about with 6lb but generally still keep it at 8lb while targeting spawning rainbows. If I getÂ a snag or throw it in the trees then usually I will only usually loose the front section of my leader and not have to replace the lengthÂ of the rod.Â When using 6lb from the first flyÂ to the second as long as it is the back fly which is hooked up you should only loose the last fly which will save you in money for both the trace and the flies. 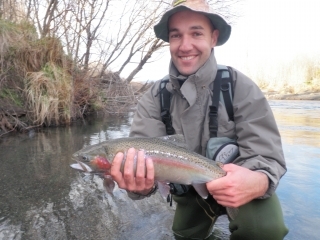 All in all there has been plenty of fish to be caught in the Taupo region and if you cant get up here now you are seriously missing out on some of the best sport that NZ is offering at the moment.